Posted on December 2, 2012 by Ai.Me.Be. 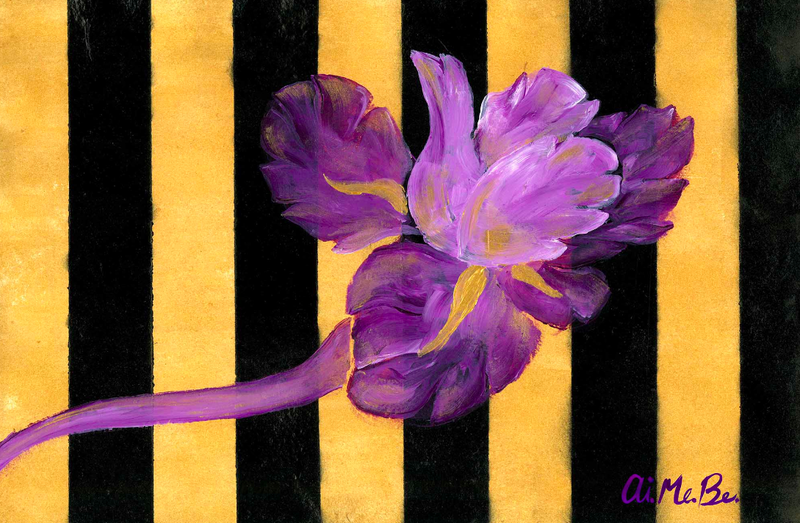 As I scavenged to come up with a name, I wikied “Iris” to double check that this flower I just painted is indeed an iris. I loved to learn that in Greek Mythology Iris – the goddess of the rainbow, who acted as a messenger of the gods. Fabulous. Also in my luggage that particular trip was a huge 7 point rack of antlers, which I’ve since painted black and gold.. This little angel cracked me up and was my personal favorite from grams..
My friend Jennifer, her husband Jamin and their new baby Maeve came to visit so I was also in a cleaning frenzy. I decided to test out silver cleaner I’d brought back just in time as grandma’s silver was starting to tarnish. It’s a lot of work to keep them clean and shiny! Also notice her cool scarf I’m using as a table runner.. Mom and I counted I’ve seen her 10 out of 12 months this year. That is a huge record for us since I’ve moved out west. Unfortunately it wasn’t for good reasons, but we have gotten very close again. I love you mom! As I’ve appreciated Grandma’s accessories, my love of painting with silvers, golds and bronzes has deepened. Love this post…I looked at every picture. Your grandma gave me some of those gold ornaments too, and I think of her very often, and, of course, when I decorate my tree. Love you so much! Great pics! !� Love your tree, especially the antlers! Aimee, I would have never thought to use a scarf as a table runner. Neat idea. What kind of silver cleaner are you using as I need to get some for the silver table sticks I got from Grandma’s? I love your tree. I have many of Grandma’s ornaments on my tree as well. Thanks Laura, I’m using “Weiman” Royal Sterling Silver Cream.